This depiction of the interior of one of Rome's most venerable Churches, San Paolo fuori le mura, is unusual for its central viewpoint, directly down the nave. 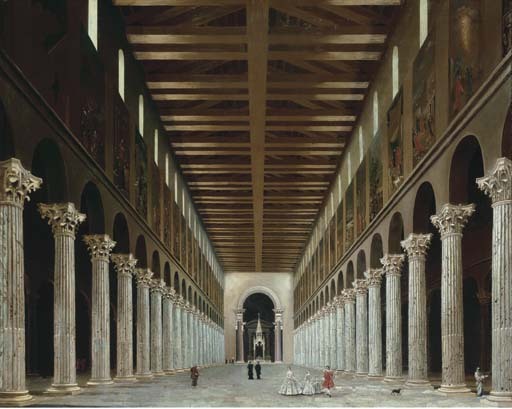 This view may have been adapted either from a print or from Giovanni Paolo Panini's famous depictions of the interior (dating from circa 1738), which take the viewpoint from the right-hand side of the nave, thus accentuating the perspective of the columns. Dr. Dario Succi has suggested that the present picture is by Antonio Zucchi (Venice 1726-1795 Rome) (private communication dated 25 October 2000). San Paolo fuori le mura was built on the site of Saint Paul's burial, just outside the city walls, on the road to Ostia. Early Christians erected a shrine on the site to venerate the Apostle, and the Emperor Constantine is said to have established a small Church there in 324. This was, however, much smaller than Constantine's other two Roman Churches, St. Peter's on Vatican Hill and St. John Lateran. It was left to subsequent emperors, Valentian II, Theodosius, Arcadius and Honorius to build a new and splendid basilica at the shrine of Saint Paul, between 384-395. This new basilica rivalled St. Peter's in size and was symbolic of the rise in influence of Pauline teaching among the early Church Fathers. The Basilica has undergone numerous reconstructions and restorations throughout its long history. Yet even to this day, it retains its original 4th-century plan. The present work depicts the interior, with some artistic licence, as it was before the extensive damage caused by the fire of 1823. The artist has slightly narrowed the central nave and simplified the frescoes on the upper walls, and on the central arch separating the nave from the transcept. Nevertheless, the distinctive row of columns with their Corinthian capitals and the wooden ceiling, recently restored during the pontificate of Clement X (1670-6), are clearly recognisable. The 13th-century ciborio is also visible at the end of the nave, framing the altar. This gothic canopy by Arnolfo di Cambio miraculously survived the fire and can be seen in the same position today.